Walkable to a hand-dipped ice cream shop, pizza parlor, several packaged goods and wine stores, Persian Cuisine, Yoga Studio and one of the Baltimore region’s best neighborhood hardware stores, this is a great find for those looking for charm and great location. If you’re looking for a night out – for a date or for a family get-together – check out Stoneleigh Lanes, one of the Baltimore area’s few remaining duck pin bowling lanes. The numerous parks in the community offer a gathering place for residents, and the tree-lined streets offer welcome shade in summer months and a great place for decorative light stringing in the winter. 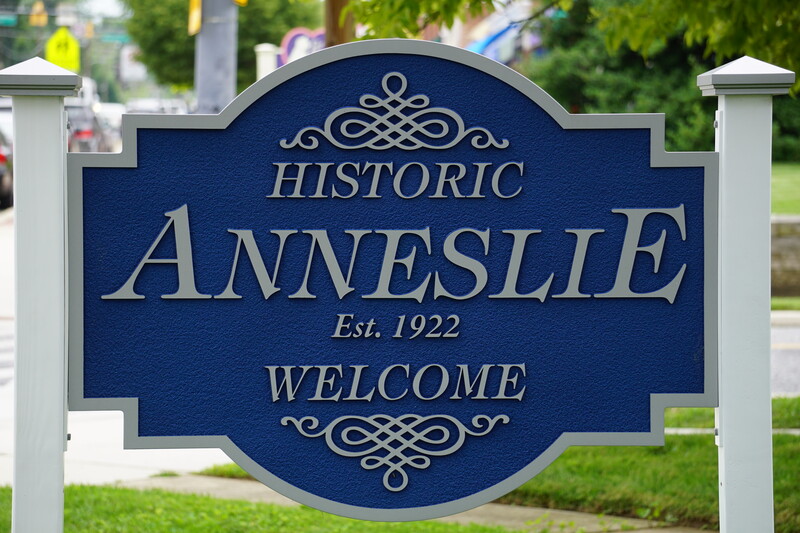 Anneslie boasts an active community association, which organizes several activities throughout the year, including an annual tour of the neighborhood’s many great homes and gardens, as well as a monthly food drive to support those in need. Ready to check out all that homes for sale in Anneslie has to offer? If so, give me a call at 443-564-0952 or send me an email. I will be happy to create a free, no obligation automated home search for you that will deliver homes meeting your criteria directly to your email. Once you have identified the homes for sale in Anneslie that you want to see we can schedule a visit. CLASSIC ANNESLIE TUDOR! Rarely available...coveted brick tudor loaded with 1930's character. Original details like the arched doorways and wood floors blend perfectly with modern improvements like the updated kitchen and contemporary finished basement. Bright and airy kitchen with white cabinetry and cork flooring. Basement was designed by award winning architect! It has a custom entertainment center, sleek flooring, and high end full bath. 4th bedroom is in basement with custom barn doors. Off street parking. Fully fenced rear yard. Wood burning fireplace in living room. Quintessential Anneslie Tudor the renovated kitchen, baths and second level. Kitchen open to dining room, granite counters, updated cabinetry and backsplash. Breakfast bar for those quick meals. Architectural details that make a Tudor special--textured walls, archways. Updates that make this home special--gorgeous master suite with new bath, closet space and a bedroom or office. Finished lower level with family room, half bath and converted garage which can be a guest room or another home office. So much to offer. Large fenced yard with a curb-cut so you can add a driveway (just check with the County and Anneslie). Play set. New renovation with addition added, full second floor, new throughout. Laundry set up in lower level and upper level. Master bedroom with oversized full bath and large walk in shower. New deck, with level yard. New blacktop driveway, finished basement, Hardwood throughout first floor, Oak staircase, stainless appliances, quartz counter, custom cabinets with back splash and counter lighting. new windows, new doors. New exterior also, windows, railings, partial sidewalk, siding. Everything is new a must see. Charming and beautifully updated 4 bedroom, 2.5 bath Cottage! Bright and airy throughout with first floor Owner's suite featuring cathedral ceilings and exposed beams. Upgraded ceramic tile master bath with separate shower and jacuzzi tub. Stunning kitchen with maple cabinetry, granite counters, island, and stainless steel appliances including 5-burner gas range with double ovens. The Shirley Manor mantle gas fireplace in the living room and the bamboo flooring throughout the first level add a sophisticated touch. Spacious bedrooms and an updated bath complete the upper level. The 4th bedroom has been converted into an office with a built-in. Walk-up basement features finished and freshly painted family room, two storage rooms, a laundry room and a half bath. Enjoy the outdoors on the large front porch or the 2-level deck. Voluntary HOA! $25 annually. Property is located in a historic district. Incredible, newly renovated Cape Cod, in the Anneslie neighborhood. Newly finished hardwood floors. New carpet upstairs, and basement. Newly renovated kitchen, two newly renovated full bathrooms, and new half bath added in basement. Freshly painted walls on all floors. Fenced back yard. MUST SEE THE 2018/2019 RENOVATIONS!! - NEW OPEN ISLAND GOURMET KITCHEN w/Quartz counters & Stainless Appliances!......Gorgeous marble flooring & Crown molding add to the detail!....Kitchen opens to formal dining room w/Dark Cherry hardwood flooring throughout the home....Private Patio & yard that was recently landscaped set up the perfect entertaining spot this Spring!....ALL NEW Lower Level boasts a BRAND NEW 2nd Full BA w/ceramic tile shower....BD4 or Private Home Office w/Dark wood laminate flooring throughout!...Replacement Wdws, Central AC, & Asphalt Shingle Roof provide efficiency & low maintenance for the future homeowner ...Home Warranty included!....Avail ASAP - Enjoy walking to your favorite Anneslie Shoppes, Pinehurst, Tot Lot or Baltimore County's TOP RATED schools - Rodgers Forge ES or Dumbarton MS....Welcome Home!! A single family in the heart of Anneslie for the price of nearby townhomes! Located in the desirable Stoneleigh, Dumbarton and Towson High districts. 3 bedrooms, including first floor bed with full bath, 2 large bedrooms upstairs with 2nd full bath. Open living room and eat in kitchen area with wood burning fireplace, fully functional finished basement complete with laundry, storage areas throughout, interior garage entrance and exterior walk out access. HUGE fully fenced rear yard complete with 3 season screened in privacy porch, perfect for bbq's, entertaining or sipping coffee in the spring. This home is warm, inviting and ready for its new owners! Many updates throughout include windows, furnace and AC, 6' privacy fence, and more. 3 car parking. Welcome to this charming bungalow in the heart of Idlewylde! This home is brimming with charm and ready for you to make it your own. Buy into the sought after Stoneleigh School District for under $200,000! The roof was replaced along with the AC Condenser in 2017 and the furnace was replaced in 2016. New windows have been installed and there is an oversized shed in the backyard for extra storage. Plenty of street parking with an easy walk to local restaurants and shops! Just waiting for your finishing touches! Come See!